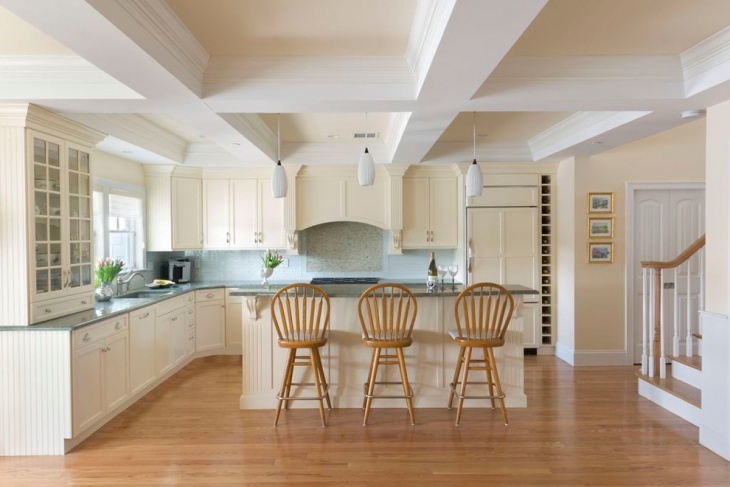 White never goes out of style, be it in home décor or fashion, when incorporated in the kitchen, traditional white cabinets in antique style make for a go-to style in kitchen interiors. When coupled with dark colors like brown, gray or beige, it appears even better. 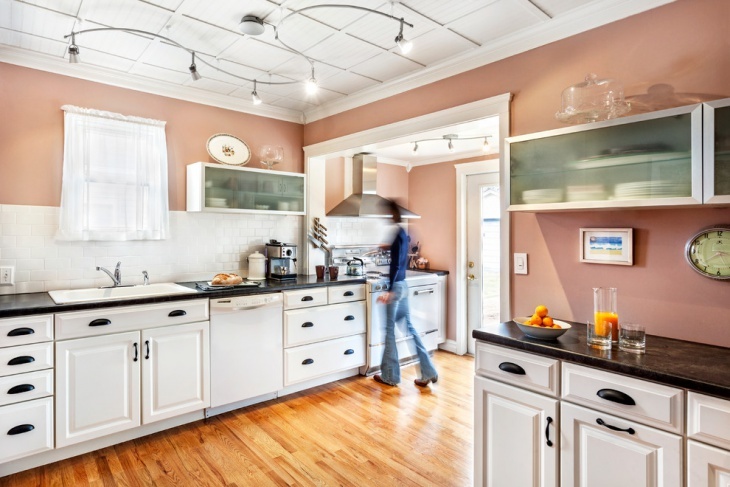 Let’s have a look at some of the antique white kitchen cabinets. 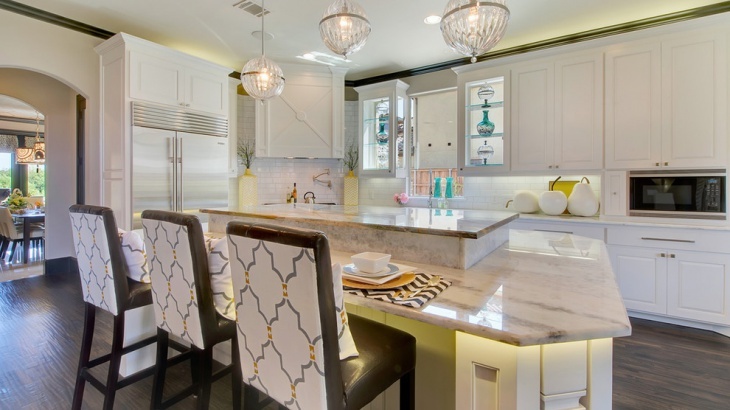 These super chic white kitchen cabinets are very stylish and add a pop of elegance to this contemporary styled kitchen. 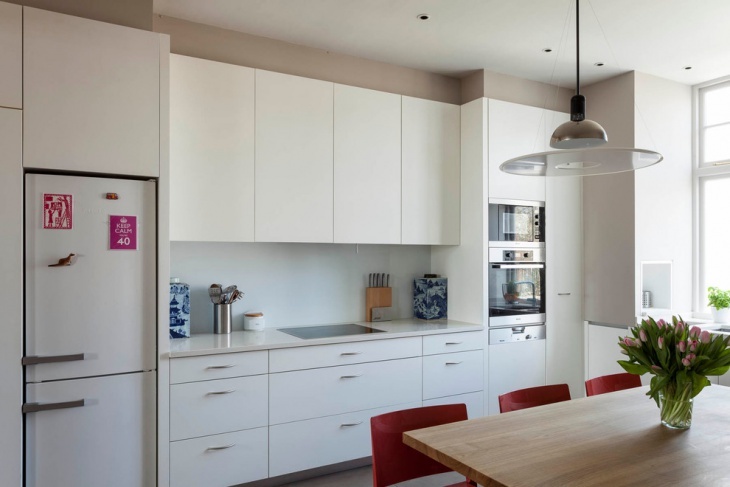 To add depth to the kitchen décor, the dining chairs are in red color alongside a wooden dining table. 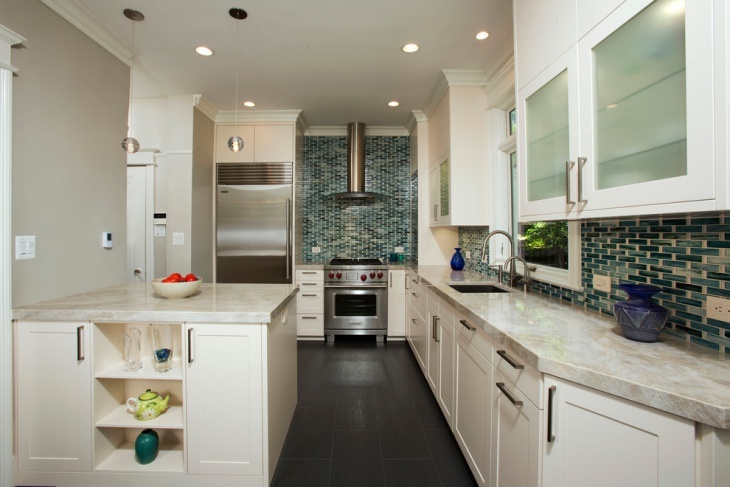 This modern kitchen features simple and elegant white cabinets on the walls as well as in the vanity. 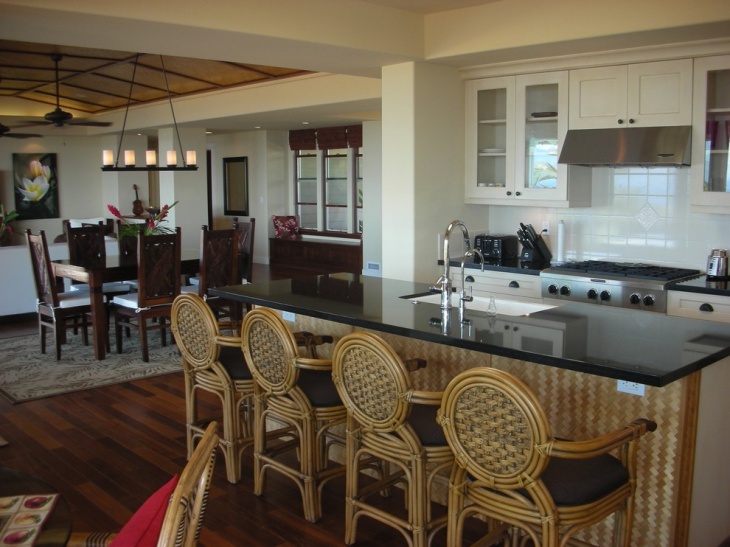 It also has a countertop with a sink alongside three chairs. 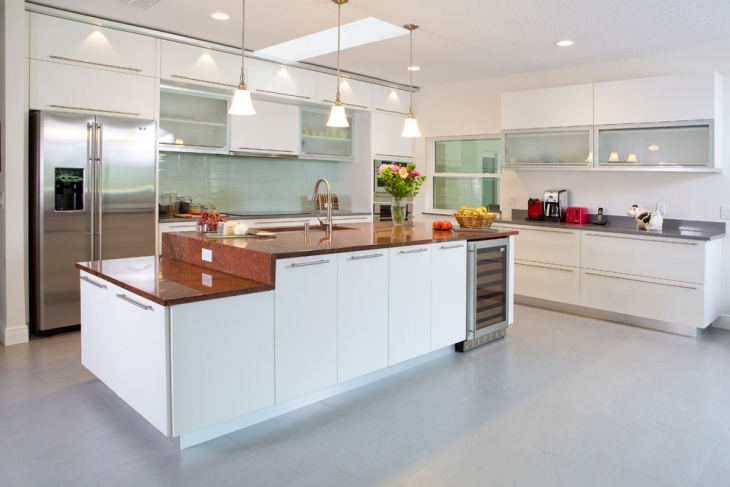 The flooring is of wooden and is brown that flatters the overall look of the kitchen. 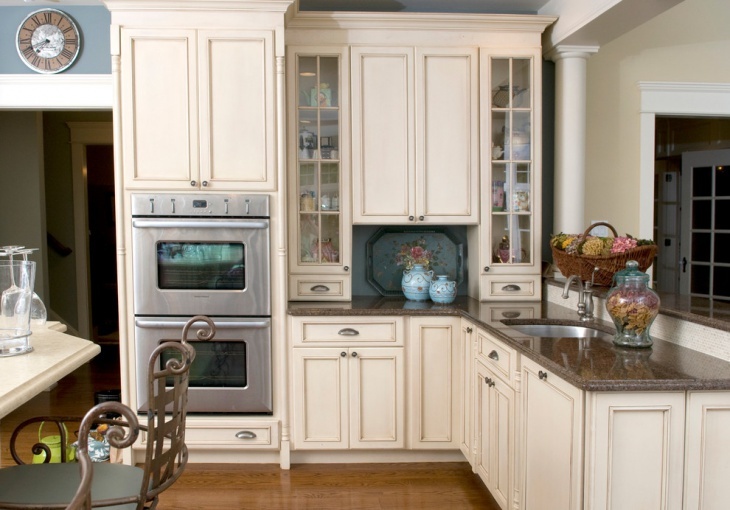 This traditional kitchen features antique cabinets in white color. The cabinets are lined on both sides of the wall and a red center carpet is placed on the wooden floor. 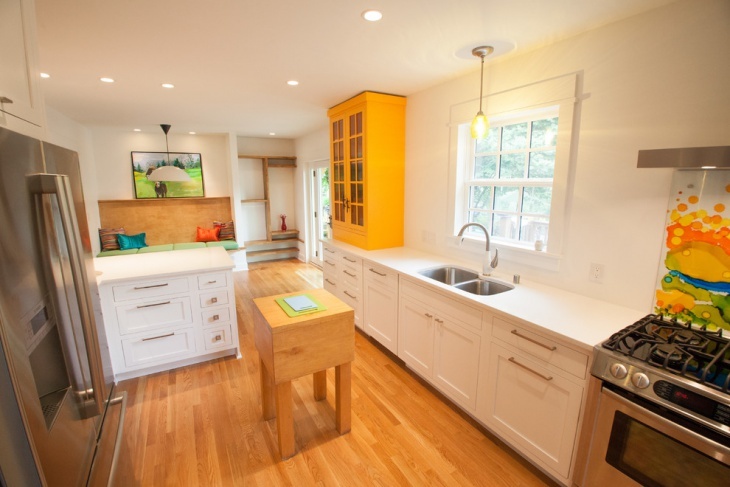 Above the cabinets is a wooden slab that can be used for kitchen chopping and cutting. 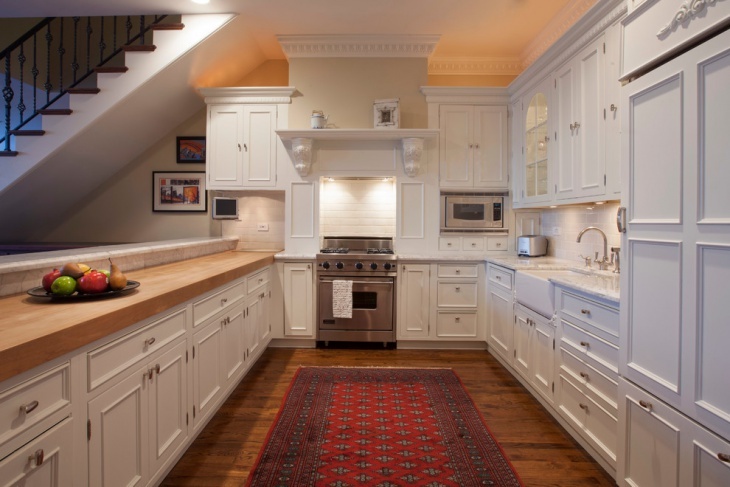 The classic kitchen with traditional interiors and white cabinets have a very charming touch on it. 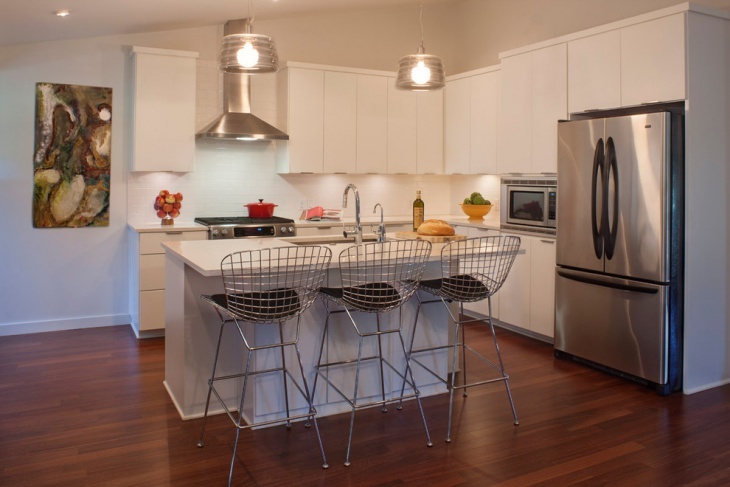 It contains white cabinets with a wooden countertop and on the other side of the cabinets have a glossy countertop with a sink and a large gas stove attached. 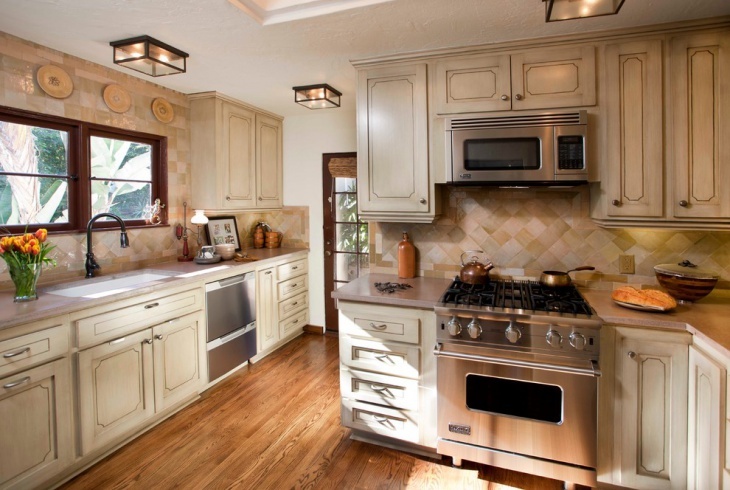 This traditional kitchen which has a luxurious finish to it contains white cabinets. It is very large and spacious thus the brown wooden flooring, dining table, and its chairs, a chandelier on top of the dining area is perfectly suited. 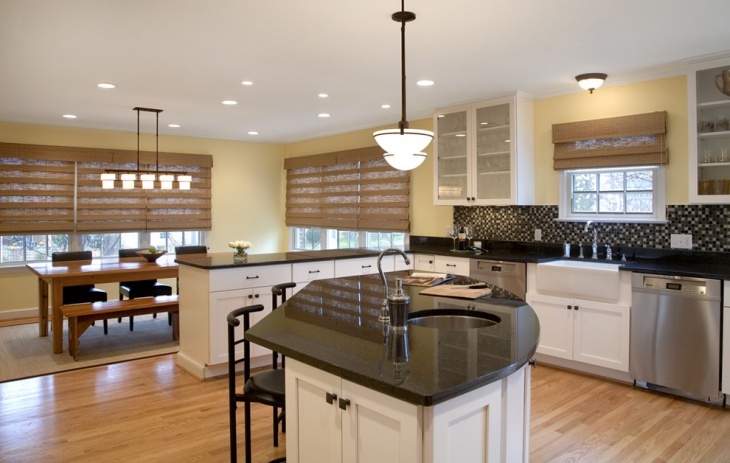 This very simple traditional kitchen with white and black themed cabinets is very stylish. It represents an antique look which appears great in traditionally styled kitchens. 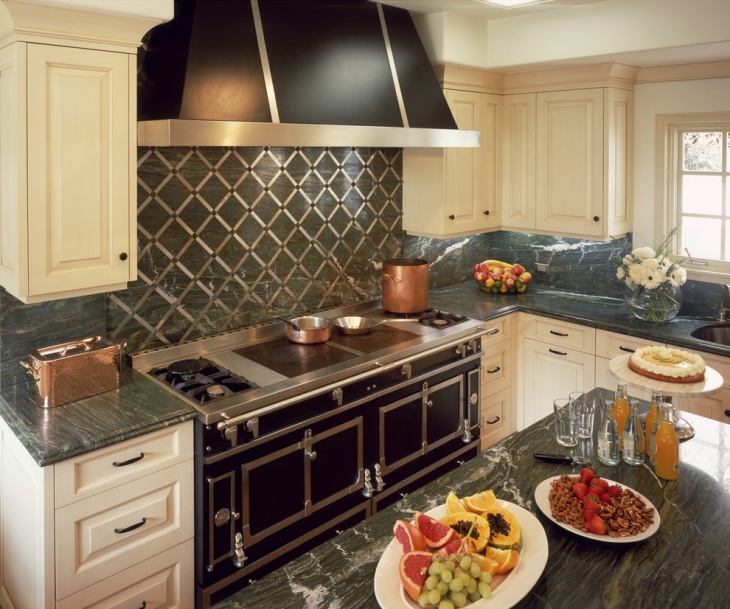 It has a green marble slab and countertop. All in all, it is a very stylish kitchen. 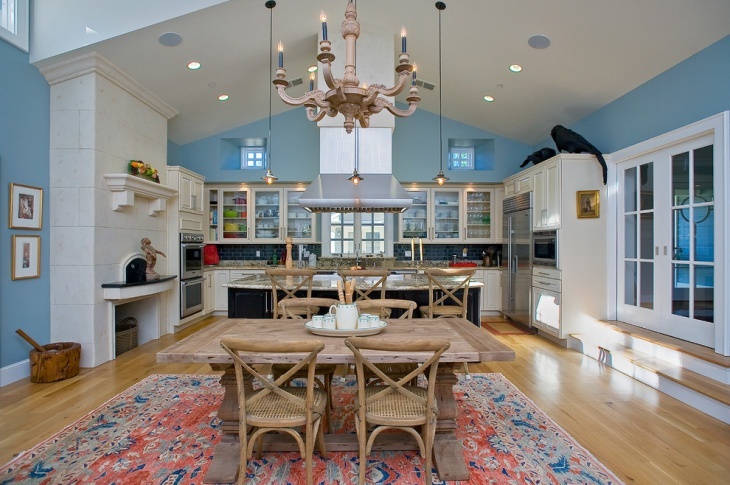 This farmhouse kitchen with a very obvious color scheme in blue and white is totally eye catching. It has a hanging chandelier with candles placed in it. 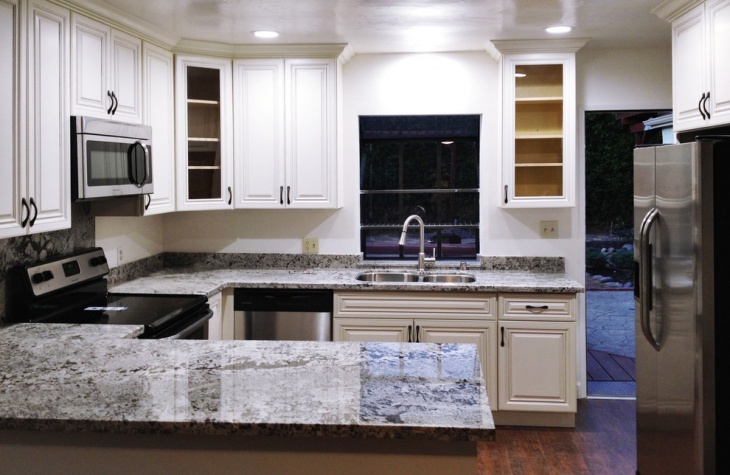 The white cabinets are large and have a great storing capacity. Black and white is one combination that never runs out of style. 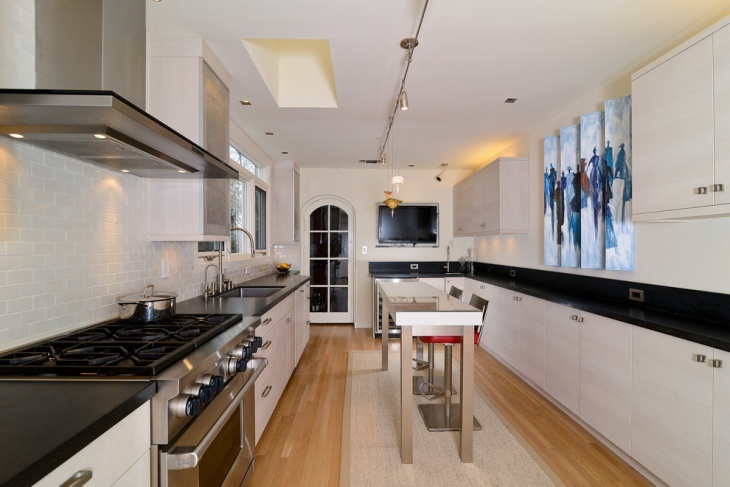 This luxurious eclectic kitchen features beautiful white cabinets with a black glossy countertop. The whole theme of this kitchen is white and black except for the flooring which is light beige. 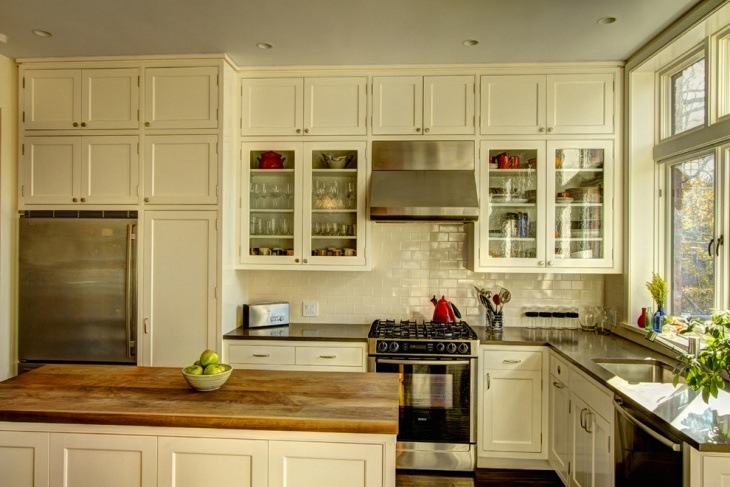 Antique kitchen cabinets can be placed both in modern as well as contemporary kitchens. White antique kitchen cabinets look not just beautiful but are also functional and allow for a great deal of storage space. 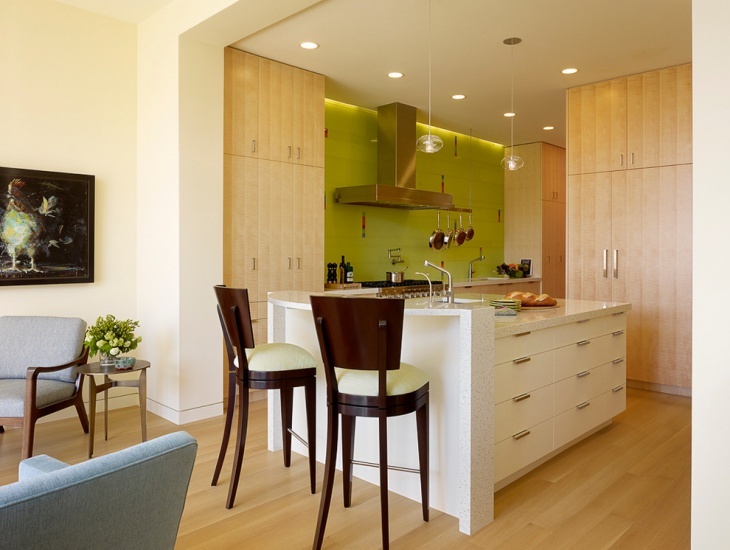 These kitchen cabinets are great to draw inspiration from and one can easily incorporate them into the home kitchen. 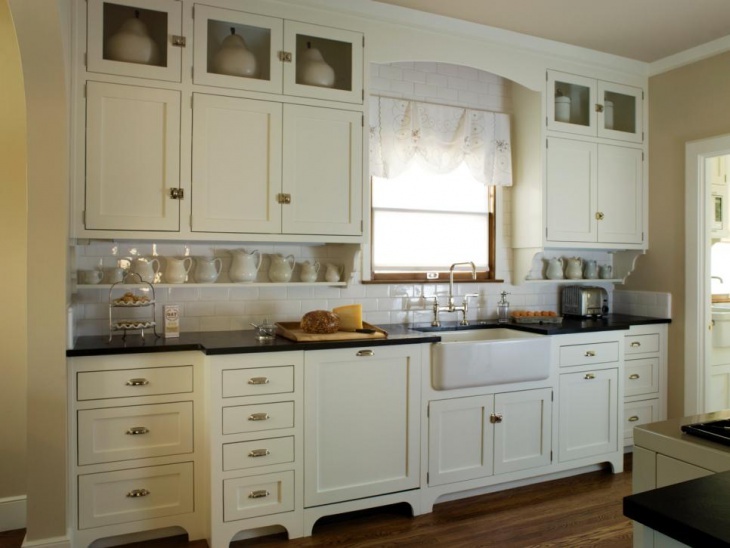 The above antique white kitchen cabinets are simple, elegant and sophisticated and make for a great design.